A timely meditation on exile and illness, love and guilt, beautifully written… I look eagerly forward to whatever he writes next. The Evolution of Shadows” is a narrative that builds. This is one debut novel that packs a powerhouse punch in the late rounds. Click Here to see the “Evolution of Shadows” video trailer..
Lian hears the wind in the trees outside and the creak of the house as its timbers contract in the cool night. The sound fades and comes back like the false sound of the ocean in a seashell. She lies in the small bed the same way she did as a child, her arms crossed over her chest and the arches of her feet pressed together. It’s the position of a corpse, and she once thought it would fool the ghosts into believing she was already dead. She tries not to think of Emil downstairs. He has told her he is sometimes unable to sleep and she shouldn’t be concerned by the sound of him pacing the house, but she can’t hear anything that sounds human. Only the wind and the creaking house. She tries to think of Gray, the man she has come to find. The way his voice sounded in the morning. The smell of his body, like a warm orange. Even in the dark she can see the small box in the corner of the room that holds Gray’s belongings, which Emil has given to her. The journal. The binder full of photos of her. Some clothes she had held to her face the first night, searching for the ghost of his scent. This is how she pulls back from the sounds of the house and drifts to sleep, her hands turning cold against her chest. Downstairs, Emil prowls, a prisoner of his memories. At night, with the silent accusation of her presence in the house, he feels as if he is constantly breaking the surface of water, exploding air out of his lungs and sliding underneath again. He counts his steps as he paces. It’s nine steps across the main room as he moves around the furniture and past the green-painted wall where his uncle was shot. He steps into the kitchen, over the place where his father’s blood had collected in the low spot by the entry, and takes another nine steps to the door that opens onto the small, dark garden behind the house. Beyond the garden are five grave markers, the dark silhouettes rising up from the ground. Sometimes he dreams there is a sixth. The one for Mira. He turns, goes back nine steps across the kitchen to the main room. Nine steps to the front door, which he opens as if expecting the dead. There is only the night air. The smell of dry grass and the faint, old smell of death. Jason Quinn Malott has been the publisher of the online literary journal The Project for a New Mythology. 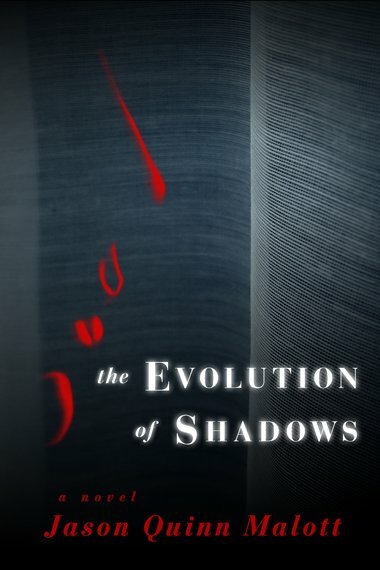 The Evolution of Shadows is his first novel. Author photo by Troy Dilport.